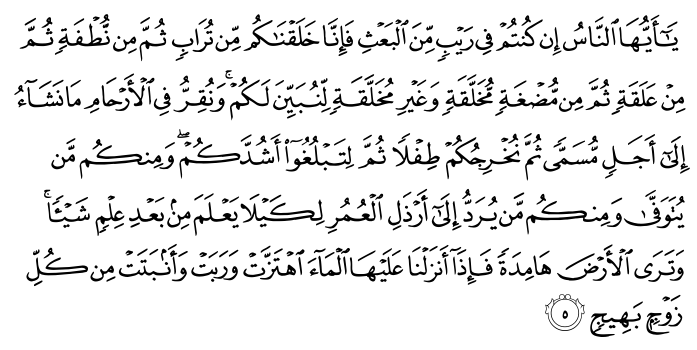 The 35th word of verse (22:5) is a coordinating conjunction. Sahih International: O People, if you should be in doubt about the Resurrection, then [consider that] indeed, We created you from dust, then from a sperm-drop, then from a clinging clot, and then from a lump of flesh, formed and unformed - that We may show you. And We settle in the wombs whom We will for a specified term, then We bring you out as a child, and then [We develop you] that you may reach your [time of] maturity. And among you is he who is taken in [early] death, and among you is he who is returned to the most decrepit [old] age so that he knows, after [once having] knowledge, nothing. And you see the earth barren, but when We send down upon it rain, it quivers and swells and grows [something] of every beautiful kind.